An urgent political play from the writer behind Let The Right One In and This is England '86. 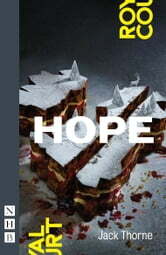 Hope is a funny and scathing fable attacking the squeeze on local government. How do you save twenty-two million pounds? Mark and Hilary, the leaders of the Council, are about to find out. Jack Thorne's Hope premiered at the Royal Court Theatre, London, in November 2014.